For some of my lectures I wanted to create handouts with blanks to fill in for the students. latex/beamer allows you to do this in a very convenient way. But it took me a while to figure out how to do this. This is why I just wanted to write a little memo in this blog post. With the initial handout tag I can toggle between handout mode and normal mode in latex. With the \ho tag I can decide whether the handouts are filled in or not. 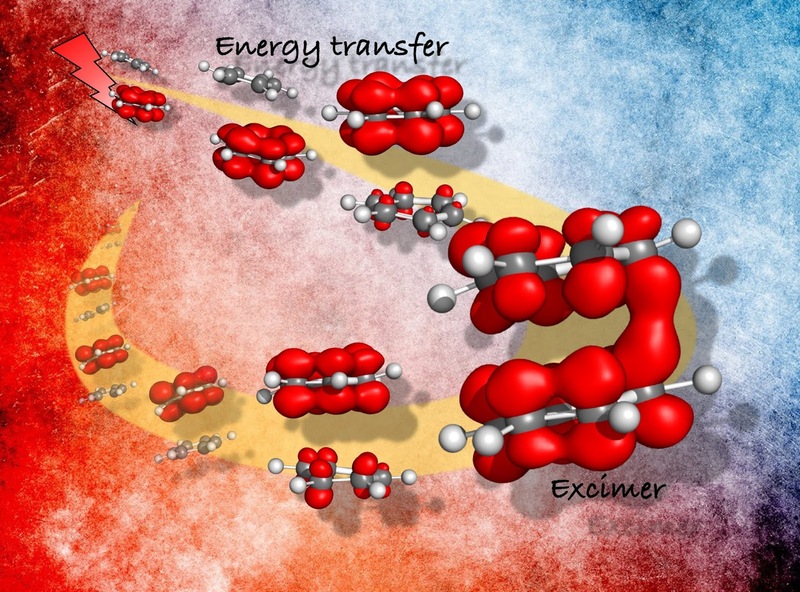 I created this picture to illustrate excimer formation in the benzene dimer after light irradiation. We start with a slip-stacked geometry shown on the upper left and irradiate this with light. Then, as the molecules align during the first few hundred femtoseconds, the coupling increases and we get an energy transfer from the lower to the upper benzene. As the coupling increases, an excimer is formed. In our dynamics, this excimer decays later on as there is no way to dissipate the excess energy. The corresponding paper just appeared in PCCP (DOI: 10.1039/c8cp06354k) and we are trying to send a slightly adapted version of the above picture as a front cover to PCCP. 1. Load all the coordinate and cube files. If you set it up in a way that all the coordinate and cube files have the same names, then everything is loaded into different frames of the same object in pymol, which is needed for step 4. 3. Change the color of the isosurface, and for some reason it seems you have to write the command from 2. again afterwards. I was previously talking about how to create surfaces automatically in VMD and even created a script for that. But actually, I am quite impressed by how well this works in the current PyMOL version. And the nice thing about PyMOL is that you can have a transparent background for the structures, which adds flexibility for creating the final image. A fully funded PhD studentship starting in October 2019 will be opening in my group at Loughborough University. If you are just finishing your Master's in chemistry, are interested in quantum chemistry and ambitious about learning new things, then go for it and apply! The pictures shown pertain to a new method for visualising electron correlation in the excited state. Here, the excitation hole (red) is moved through the system and one observes how the excited electron (blue) adjusts to the position of the hole for the different excited states. I will talk about this idea some more once the underlying paper is published. 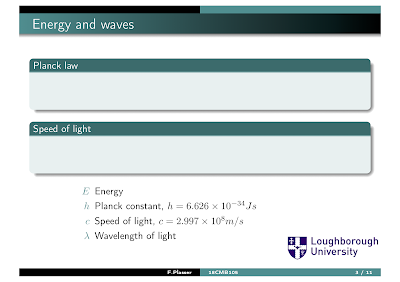 The tasks to be carried out during the project revolve around the topic of excited-state wavefunction analysis. First, we would be applying some of the recently developed tools, available within TheoDORE, Q-Chem, and Molcas. This work would be similar to this post or this post. Subsequent work will be a combination of programming and/or scripting tasks together with applications. You can find the official announcement and guidelines here. I guess the main point to realise is that we can only pay a stipend to UK/EU graduates. Others would just get their non-UK/EU tuition fee covered and not obtain a stipend on top of that. If you are interested, go ahead and check out my new group's homepage. Feel free to contact me if you have any specific questions about the work to be done. An electron-donating group adds more electrons to the system and thus increases electron-electron repulsion (or decreases the effective nuclear charge). As a consequence the HOMO and LUMO energies increase. An electron-withdrawing group removes electrons and, thus decreases the HOMO and LUMO energies. An electron-donating group usually acts through an occupied non-bonding orbital. This is energetically close to the HOMO. Therefore, it has a stronger effect on the HOMO than on the LUMO (at least in organic molecules). An electron-withdrawing group acts through a virtual orbital, which interacts more strongly with the LUMO. As a consequence, electron-donating and withdrawing groups are both expected to lower the HOMO-LUMO gap in organic molecules. Things are different for transition metal complexes. For example an electron-withdrawing fluorine group still lowers orbital energies. But it can affect the HOMO more strongly and increase the overall gap in fluorinated iridium complexes, see this Ref. Staying true to the topic of cheap nonadiabatic dynamics simulations, here is another paper by us: Surface hopping within an exciton picture - An electrostatic embedding scheme that just appeared in JCTC. The idea in this case was to speed up the efficiency of photodynamics simulations by doing computations on individual chromophores and combining the results through a Frenkel exciton model. Lecturer in Physical and Computational Chemistry at Loughborough University, UK. Visit my group homepage to get an overview of my research activities. Stop Citing High Impact Factor Journals - Editors of high-JIF journals hold too much power. This is how scientists may force them to change practices.